Whenever a character is healed, gain +2 Attack. She’s smaller than her sisters Mediumwarden and Heavywarden. WOW. You predicted the meta 3 years ago. Well, Light of the Naaru is better than Lightwarden in most ways. RIP. Not that you ever lived. I LOVE her. I like to use my power word: shield on her early in the game. She makes an excellent first round pick for my priest deck. 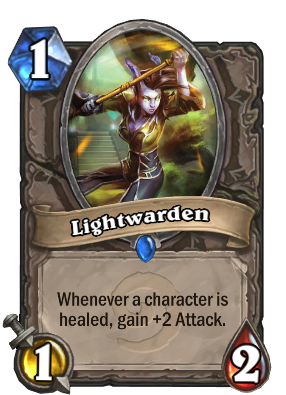 As of 14/10/13 this card does not gain attack power when on the board and the priest card http://www.hearthpwn.com/cards/431-power-word-shield is played (but the card http://www.hearthpwn.com/cards/600-northshire-cleric does proc (making you draw one card for each minion healed), although the description on both cards, is the same. Considering that Alexstrasza's effect being considered a heal if you're below 15 health is a known bug, I assume the bug is with the Northshire Cleric responding to Power Word: Shield rather than this card. @TBrianOnline This is all fixed, now, right? NSC doesn't proc any more. So it's all correct - this is not a heal.